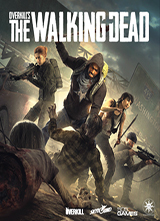 Overkill’s The Walking Dead follows a group of survivors – Maya, Heather, Aiden and Grant – as they fight to stave off death in a post-apocalyptic Washington D.C. This of course, is easier said than done. Not only do they have to scavenge for food and supplies in a city overrun with zomb…uhm…walkers, they’re also besieged by rival groups. These violent adversaries are only concerned with their own survival. Meaning, they don’t mind killing innocent people for their stuff or forcing them to join their ever-growing faction. This of course results in multiple shootouts as the game’s protagonists struggle to secure their little piece of the world. There isn’t much more to the story than that. A central character will give a brief update before missions (during the loading screens), providing a reason for the coming events. There’s an overarching plot – characters who die stay dead, alliances are made, etc. – but it’s presented in tiny parts that are mostly forgettable. That said, this minimalist approach works to a degree when attached to the Overkill formula. Similar to Payday, players are presented with map that slowly fills with locations as they progress through the story. Clicking on them will start matchmaking, where a team of four can choose their characters, weapons, and other equipment before jumping into the level. It’s like getting ready for a Payday heist as everyone tries to grab items that’ll complement their characters and help the team. For weapons, the defaults are best. When playing as Heather, for instance, one should choose a crossbow. Aidan does the most damage when using shotguns and baseball bats. Old man Grant is the designated sniper. It’s possible to use other weapon types, based on the level – more on that later – but each character leans toward a certain playstyle. The same goes for their special abilities. Grant’s not only good with a sniper rifle, he can also mark enemies, making them receive extra damage from the team’s attacks. 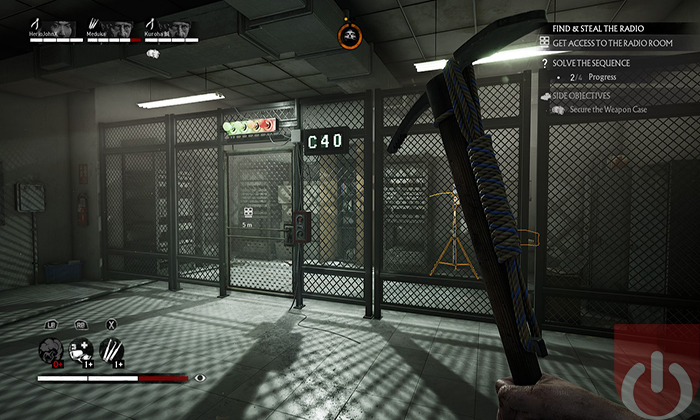 From there, the bulk of the game is spent in different locations around/under D.C. Players will usually need to traverse through a walker infested area to find an important item, rescue a character, or assault a rival group’s base of operations. The are puzzles that need to be solved and enemies to dispatch before it’s time to send up a fair, summoning another survivor to come pick you up in their truck. Of course, there’s more to it than that. Puzzles are randomized. Players might have to restore power to a mechanized gate by finding gas canisters and fuses scattered around a level in one playthrough. In another, they might have to find and kill a walker holding a keycard or locate missing parts to a forklift before using it to raise debris blocking an exit. 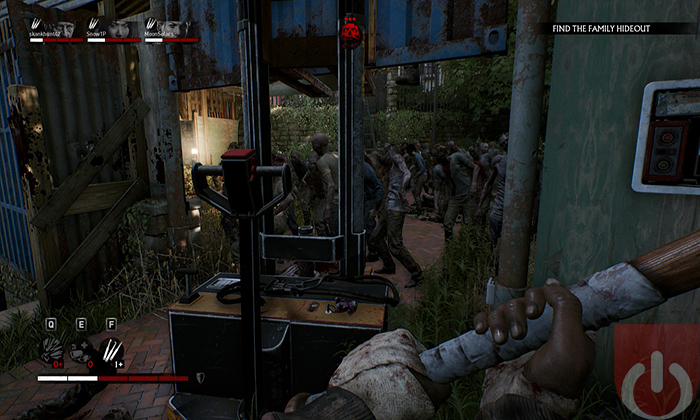 Secondary items can be used to open up alternate paths; a lockpick can open a door, bypassing a large group of walkers for instance. Stopping to craft one of these items is risky considering there’s no way to pause the game. Most humans will immediately pose a threat. Having locked down parts of the city, different factions will patrol an area and attack anyone the comes near. Dealing with them can be tricky as any loud noises will attract walkers. There are times where both sides (the players and NPCs) are forced to deal with a horde after engaging in a shootout. There’s usually a lot going on within a given level. That said, they all feel trivial in the grand scheme of things. There is a logical order based on the plot. But very little of the story is seen during actual gameplay. Instead, the important bits are saved for the narrated updates. Again, it’s like Payday. Except here, players will get something to hold onto plot wise. It isn’t what most people wanted – a thrilling narrative akin to what’s seen in other media concerning the Walking Dead. It is better than what’s found in other games of this ilk, where the plot is found in visual clues within a map or the seemingly random dialogue spouted by each character. The main campaign missions aren’t as great as they could be. Some of that has to do with the lackluster story; being better than nothing doesn’t exactly equal engaging content. They also don’t provide much variety. Broken into seasons*, they all flow into one another. Players are either looking for supplies or attacking a rival group. The levels themselves help to spice things up. Some of the locations players will visit feature an iconic design; it was only a matter of time before the protagonists ended up in a mall. And playing with friends often leads to an entertaining couple of sessions. That said, things do become overly repetitive rather quickly. Overkill Studio did get the walkers right though. They are highly detailed, disgusting looking creatures that shamble about until they notice someone. What makes them so great is their deceptive nature. It’s easy to believe that a location is safe because there is maybe one or two walkers. Then all of a sudden, a group stumbles out of a door and everything is turned upside down; Overkill was somehow able to populate environments with a large number of walkers without crashing the game. Making matters worse (in a good way) is the walker’s ability to grab a player. The walkers can latch on, pulling the camera towards them as they try to bite their prey. The only reprieve is a strong shove or a knife to the skull. If more than one grabs on someone at a time, they could go down. Even if they’re at full health. At that point, another player would need to clear away the walkers and help them up. It’s a clever mechanic. And while it can disorient the grabbed player (the camera will be pulled in the walker’s direction), it often evokes fear as it simulates a realistic encounter with the undead. The developer also did a good job with the noise mechanic. It isn’t perfect. The rival groups either don’t care about attracting walkers or don’t know that throwing grenades is a surefire way to get eaten. It does, however, promote teamwork amongst players while offering a natural way to increase a level’s difficulty. It also helps in cutting down on the repetitiveness. There are sessions that feel completely different due to someone accidentally setting off a car alarm. Good or bad, all of the main levels fare better than the terribly designed horde-like missions. 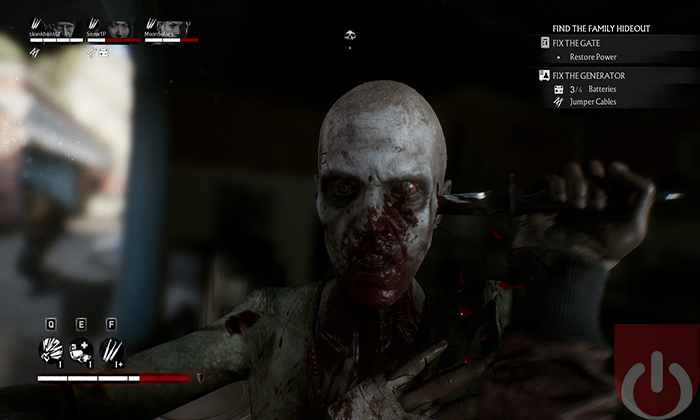 Overkill’s The Walking Dead is built on survival horror elements. Where things like opting to use melee weapons in hopes of rationing one’s bullets is a solid tactic. 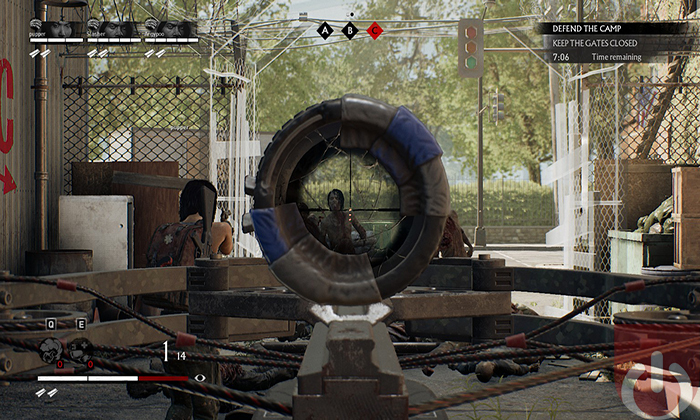 For most of the game, players are required to be strategic, making sure to move quietly as to not draw unwanted attention. The systems that allow for this sort of gameplay – which made the game interesting – is thrown out for these missions. They are replaced with generic shooter mechanics that can’t keep up with the onscreen action. The aiming of weapons isn’t as tight as it should be. Human enemies, especially late in the game, are bullets sponges. They also seem to have perfect aim, despite their questionable pathfinding. An NPC will stand land most of their shots while struggling to get around obstacles. It all boils down to a frustrating experience that goes against the tone established early on. Sure, the main levels also feature explosive segments with heavily armored humans. But they are saved for important moments, with fights that are typically short lived; it’s easier to forgive minor issues with combat when the game doesn’t prolong each encounter. Characters can be leveled up to increase their health, allow them to carry more stuff, improve their damage output and more. The same thing goes for their home base. 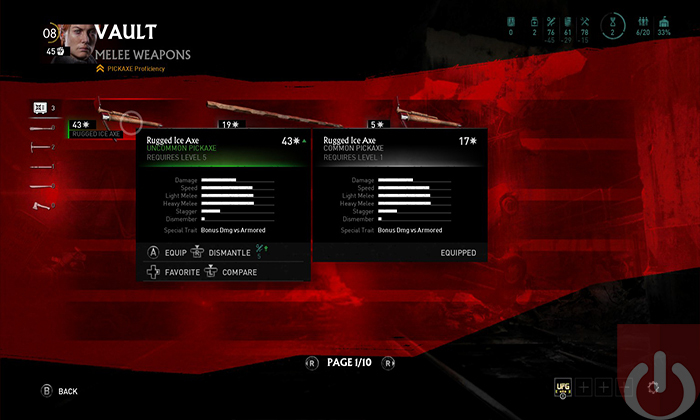 By assigning rescued survivors to different stations in the camp, they can improve a long list of stats ranging from an increase in productivity to the granting of buffs to specific characters. They’re like the survivors found in Fortnite’s Save the World mode, only they can also be sent on missions to retrieve needed supplies. New weapons can be found and/or rewarded after completing a level. From there, they can be improved with silencers, scopes and other mods. These extra bits are a nice touch as they help to make surviving D.C. less of a daunting task. They don’t really change how someone would play the game though. Managing survivors feels more like busy work than anything else. And because certain characters have an affinity for certain weapons, changing their loadouts to anything but what they’d typically use seems counterintuitive. Some found items weren’t worth using regardless of character; they’d appear to be uncommon or rare, but wouldn’t produce any changes stat wise. In other words, the carrot on the stick isn’t very desirable. The Walking Dead is one of the hottest franchises around right now. Comics, video games, two television shows – AMC even announced a film series. One can’t go more than a few months without hearing something about a project or event that’s connected to Robert Kirkman’s creation. The good news is that most of it is well received by fans. Unfortunately, when it comes to The Walking Dead video games, they tend to struggle quality wise. Overkill’s The Walking Dead is no different. It can be fun; I did have a good time with friends. And some of the game’s horror-based mechanics were cleverly implemented. It just isn’t enough to keep fans invested, let alone anyone looking to purchase a new game this holiday season. *As of this writing, the game’s second season has landed on Steam. Overkill is offering more content to everyone who bought the standard edition of the game. They’re also working to address complaints brought to them by the community. Basically, Overkill’s The Walking Dead is slowly changing for the better. Overkill’s The Walking Dead can be entertaining. Some of the game’s mechanics work well together and the walkers prove to be an intimidating force. That said, a lackluster story, frustrating horde-like missions, and weak progression elements bog everything else down. Overkill was able to get an impressive number of walkers on screen without crashing the game. Most of the other visuals – sans a glitch here or there – should be well received. The sound effects, music and voice work is ok at best. It depends on how much you enjoy the campaigns main missions. They are repetitive in nature and the progression systems aren’t that great. Each mission does offer fresh moments, thanks to the random nature of puzzles and item placement. The second season will also help in this regard.